I can optimize your wifi. For me, it’s all about knowing what you need and building a system around you. I can expand or upgrade your existing setup. Residential or commercial, the lines are blurring between them these days. Optimizing the latency for gaming is a key for gamers. Placement is determined by your needs. Use less data when your entire home is covered with wifi. 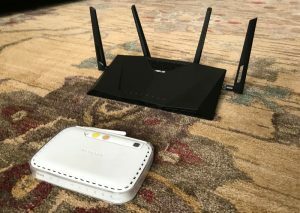 Most consumer routers stop getting updates after a few years. Stay secure and keep performance up. This 7 year old (white) router was out of date and nowhere near as capable as the new model (black). Sometimes better coverage and performance is easier than you think. Lets setup a consultation to figure out what meets your needs and go from there.